I got word from Derek Charles yesterday to say he and Majella Callaghan had a probable adult Slaty-backed Gull at Killybegs. Brilliant news but there was one little issue for myself, I was in Kerry for the day at the other end of the country! I had gone down to see the male Black Scoter at Rossbeigh which had been found the previous week. I joined up with John Murphy and Finbarr MccGabhann in Newmarket-on-Fergus, Co. Clare at 0700 hours having left Clifden at 0430 hours. The road were quite icy particularly on the way into Galway City. Anyway it was a very productive trip as we easily found the Black Scoter although it was just too far to even think about getting even record shots. Probably not the most exciting lifer I've ever had in Ireland but still. Later we had the long staying Spoonbill and five first-winter Glaucous Gulls at Cromane and also had decent views of the American Coot at Lough Gill. So after finishing up in Kerry I made my way back north on 440km trip up to Killybegs. I stayed overnight in Charlestown, Co. Mayo. The roads were starting to become decidedly dicey at this stage by the time reached Charlestwon at 2100 hours. 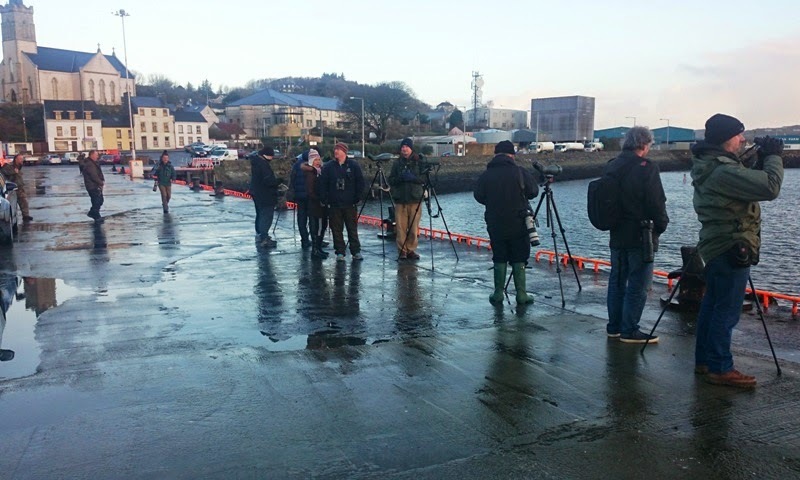 I managed to get up to Killybegs Harbour in reasonable time this morning considering the state of the roads. A quick look at the mudflat produced nothing so I moved onto the Main Pier where I immediately picked up the Slaty-backed Gull eyeing up some rubbish bags left beside the pier. Derek and Majella were already on it along with one or two cars. It showed at close quarters however the sun had yet to rise over the horizon so that coupled with some light drizzle meant the photos below were taken in horrendous light. After about 15 minutes it got up and flew the short distance to the slipway between the Town Pier and the Blackrock Pier. It remained here on the end of the end of the slipway for another fifteen minutes. Unfortunately it spent all its time here facing us with the sun behind it at a longer distance. It then got up and flew off back east towards the Main Pier, disappearing behind the pier buildings. Surprisingly it wasn't seen again for the rest of the day to the dismay of several travelling birders who missed it by only five or ten minutes. My shots are quite poor and I'm not at all happy with them especially the flight shots. Seamus Feeney @northwest_natur and Declan Skehan @SkehanSligo took some great shots of it yesterday after travelling up from Sligo yesterday. It was on show for much of the previous day and was a big fan of the sliced pan apparently. I wouldn't mind catching up with another it or another one but I can't complain too much, at least I got to see it unlike others. It certainly looks like a different individual compared to the Galway bird from last year. The Donegal looks like a bigger individual with a larger, thicker bill. So quite a productive weekend for me. It's been a long time since I got two lifers in Ireland in such a short time period. 2015 seems to be off to a good start , I wonder what's next? Part of the twitch today including the happy finders. Congrats on a tickfest of a weekend, Dermot! Great write-up. Thanks Mark. Really enjoying your Antarctic Adventures blog posts - fantastic shots. Keep them coming! Missed the London one a while back, managing a day long miserable dip in the process. At least there's hope of another !